Well. I can't say that this has been an easy path to travel,...and I'm still not there yet, but there is a light at the end of the tunnel. I decided to copy Does10's method of making a roller chain for a SBF work on a 250. So I went out and bought a true roller set from Summit under their brand name. What I got was a billet gear set w/ a built on torrington bearing on the cam gear that rides against the thrust plate, and a 9 position crank gear, all for the bargain price of 69.00. Now according to what Does10's has done, he took his chain to a local guy that supplied him with the master link so that he could remove one link, and put the thing back together, effectively making the SBF 58 link chain work on a 56 link (250) application. So,..I put a cheese sandwich and an apple in a knapsack,....tied it to a stick,...threw it over my shoulder,..and set off down the road to do the same thing. Immediately hit a dead end. There is no "local guy" in Birmingham. I went to the online road,.....found several companies that offered roller chains, and their components,..but again....ran into a road block. Seems that not all roller chains that fit a SBF are "one size fits all". So I contacted Does10's to see what type of chain he had so I could send mine back, buy his type of chain, and use his guy to get the master link. I get back on the phone with the one online company that offered the most help and told her that I had given up trying to buy a complete chain, and could she just supply me w/ a master link for mine? That conversation resulted in a referral to another number,...and that conversation resulted in a referral to another number. The last number got me to PCI in Washington. The chain you need is used in 1968-79 Toyota Corolla. The Corolla used a KC & 3KC engines and Japan made the chains as well as many countries. This roller chain was developed by the British many years ago and the technology was mostly developed in India prior to 21st century. You can probably find one at any “old auto parts repair shop or store”. The industry number is 3DR56 our part number is C2356. I happen to have a bunch, but three of them and the good India made chains. These are strong like Japan. In fact, even some of the better Taiwan chain is fine too. I have Taiwan and the 3 India. The India chain is what I think you will like the best. Both are solid bushed roller chain. I can help you with what you need if you can’t simply locate one locally. Check locally first! Ask around for simply a “3DR56 Melling Chain” and say “or any brand” and if they have one, ask “where was it made”. Then ask if it is “continuous” or “endless” (has no connector link). Do not buy an open ended chain & do not buy a China or Taiwan in my opinion. It should not cost over $20.00 maximum in my opinion. Look on line too! Now why in the world would I go to "any old auto parts repair shop or store" and fight the idiot at the Autozone counter when I have the guy who knows what chain I need,...has the one he thinks is best,...and will sell it so cheaply,...I couldn't buy a stock chain for less? Can you see the look on the autozon guys face if I ask him where the chain was made, or whether it was a continous, or endless link design? So I bought it from him yesterday. Now, as opposed to having to cut a link, and use a master link to repair it with, I have an unmolested, continuous chain that should fit. That leaves me with the machine work bit of the equation,..I still have to drill the cam, turn down the nose of the cam so the sprocket will fit. Then turn down the nose of the crank, and make the necessary reference marks so I can install the thing and get it somewhere close to correct timing wise. still have to drill the cam, turn down the nose of the cam so the sprocket will fit. Then turn down the nose of the crank, and make the necessary reference marks so I can install the thing and get it somewhere close to correct timing wise. thanks for the 250 project intro, 'hope to hear (and see) through completion., the Toyo' chain with OEM GM sprox is the idea? . powerband wrote: still have to drill the cam, turn down the nose of the cam so the sprocket will fit. Then turn down the nose of the crank, and make the necessary reference marks so I can install the thing and get it somewhere close to correct timing wise. the Toyo' chain with OEM GM sprox is the idea? Thanks, but it's a SB"F" sprocket. Where'd you get that I was using a Chevy sprocket? You should have researched this before you had the cam made, then they could have ground the nose on the cam for you before it was heat treated. Now that that 8620 steel is heat treated, it is now one of the hardest substances on the planet now and is going to be extremely difficult to cut, even with carbide tooling. I am thinking why not just bore out the cam and crank sprockets too fit? If the cam uses a dowel pin like the SBF cams use, you might bore into the dowel hole depending on how much smaller the snout hole is compared to the 6 cylinder cam snout. You also are assuming the spacing between the dowel hole and snout are the same for both engines. Not saying it can't be done, but at this point you need to slow down before you end with altering parts that can't be used or returned. CNC-Dude wrote: You should have researched this before you had the cam made, then they could have ground the nose on the cam for you before it was heat treated. Now that that 8620 steel is heat treated, it is now one of the hardest substances on the planet now and is going to be extremely difficult to cut, even with carbide tooling. Well I know this now. At the onset of the cam build phase I had no idea that the timing chain for this engine sucked so bad. I also did not think about asking him to alter the cam to allow me to use a SBF sprocket, I was just glad to get a cam made. Now it is what it is,..I have to make that SBF sprocket fit that cam. Whether I have my machine dude turn down the nose, and possibly cut dual keyways, then do the reverse to the gear, or actually drill the front lobe for the dowel pin, there is far too much spring pressure to rely on the stock setup. The way it is now is reliant on the stupid set screw that is used on the stock setup. Right now, I'm open to suggestions. Not sure how much smaller the SBF cam snout is compared to the 6 cylinder. If its too much, you could actually turn the snout down past the depth it is heat treated and have issues with that approach if you try to turn down the snout. You won't drill another dowel hole in the cam journal, it will have to be EDM'd(huge bucks), plus their probably aren't many in your area of 'Bama that can do it competently. Just shop around cautiously. I think that there are duel roller timing sets made over in Australia for there engines. maybe you get a set of gears that fits your cam and crank then use the right length chain that you just found. Good luck in the hunt! Do the changes to make the SBF cam sprocket fit. Knock yourself out. You'll find out a way to make it work. The US changes were because of development failures, and Dearborn weren't happy with releasing the US 250 with an Aussie 250 timming set, and the cam isn't in the same position in the block as the Aussie tall deck 250. You could be like me, and spend all your time researching, but you have to be building and researching...learning to do both will save you money in the long run. The use of Japanese and Indo European Eastern timing gear works both ways, the Japanese used off the shelf Aussie timing gear and chain sets on some new engine lines to cut down development time. 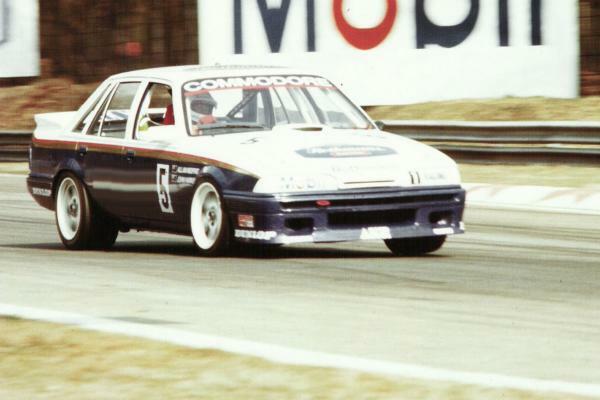 Over here, the 1987 Monza World Group A race was one by one little 420 hp Quadrajet carbed 304 Aussie Holden Commodore. At the 1987 Spa 24 hour race, it was fourth. The twin roller timing chain set on was from the 18R Toyota Corona, as the Japanese copied the early 253/308 twin roller timing chain, and after the 1985 Monza attempt resulted in a GM Holden downgraded broken timing gear, it reverted back to the orginal 1969 TO 1971 item before it was downgraded, and that was what Toyota used as well. Well I contacted my machinist, and he concurred that I'm in for a tough time. He had me contact a local heat treater, to see what could be done. The heat treater told me that under no circumstances did i want to try an anneal the cam, then have it re-heated, unless I wanted to risk warping the cam, and thereby effectively throwing away 600.00. He did recommend a solution as a "better than nothing" approach....and recommended that I spot anneal the area that we would drill the cam face for the dowel pin w/ a torch. The process involving focusing a small flame on the direct spot we intend to drill, heating it to cherry red, then allowing it to cool to room temp. He said that it wouldn't completely be a cake walk after that, and it would probably still kill the bit (or two) but at least I'd would be more likely to get the hole drilled that way. I'm gonna measure the cam sprocket, and see how much smaller it is than the cam, and possibly have the sprocket reamed up to the existing snout diameter of the cam, as opposed to the other. I was thinking that maybe as an alternative to any of this, I have the nose of the cam ground, and put a "flat" surface on it. Then, I can add that material via welding to the sprocket, and have it all machined to fit the flat spotted snout of the cam. What do you guys think of that? Would a flat spot on the snout be enough to keep the gear from trying to spin on the cam? Something like this, only it wouldn't be so close to the center, just eccentric enough to make for the most flat area possible. Never ends, does it Mike! I'm not going to recommend anything, but I'll throw some thoughts out here. The 200 and 250 uses the same cam. I've used higher than the stock spring pressures, run a modified 250 oil pump with extended high volume georotors, shifted at 7500, missed shifts would go to 8000, zero timing chain, sprocket issues. I always cleaned all the mating parts and used stud and bearing mount with the proper primer. So what I'm saying is, I think the biggest issue is a harmonics issue because of the longer stroke 250 crank shaft loosening the bolt. Keyways and pins aren't supposed to keep it from spinning, they're mostly for locating. It's the clamping force that keeps things from spinning. So I think if you improve that, you'll be a lot better off. Maybe a stud with fine threads for the nut, thick hardened washer. Of course, you'll have to make an inspection cover that will clear the longer assembly which is what I plan to do for easy inspection of the bolt. Only you will know if you have room to do so. Personally, I'd be tempted to just use a hardened drive pin and bore the sprocket larger. Why make the nose of the cam weaker? Epoxy the area where the pin is. Maybe make something up quick and do some destructive testing on some old stock stuff. I really like your thinking of the flat spot. Why do you need to weld the sprocket? Isn't the sprocket smaller than the cam? Isn't there enough room to mill it out on a rotary table like you drew using a small mill and some kind of hand work for the corners? I hope this sprocket isn't powdered metal. Your waaay overthinking this Mike. Send the cam to Comp and have them EDM the dowel hole for the SBF location. Bore the SBF cam gear to match the larger 6 cylinder cam snout. Call Cloyes and have them make you a chain to match the timing set pitch of the gears you have, or make the master link setup work. Finish making your intake and in a few days the parts will return and you can just bolt it all together. 2 phone calls and your done. CNC-Dude wrote: Your waaay overthinking this Mike. Send the cam to Comp and have them EDM the dowel hole for the SBF location. Bore the SBF cam gear to match the larger 6 cylinder cam snout. Call Cloyes and have them make you a chain to match the timing set pitch of the gears you have, or make the master link setup work. Finish making your intake and in a few days the parts will return and you can just bolt it all together. 2 phone calls and your done. Naw,..I only wish I was . Looking at the SBF gear I have, and measuring the cam snout on the cam. If I left the cam snout the size it is, it would encroach into the dowel pin. The existing cam snout measures 1.00" and the ID of the SBF cam sprocket is .872. When you look at that cam sprocket, the dowel pin hole almost touches the cam snout hole. Is that d amn dowel pin that fits the 250 cam really that bad that I cannot just use it? There shouldn't be anything wrong with the dowel pin, they are all heat treated and should be very hard and strong. Another option is you can redrill the SBF cam gear to match the dowel location of the 6 cylinder cam once you open the ID up to 1.00". That would be the simplest fix you can come up with. Just make the gear fit the cam, instead of trying to make the cam fit the gear. CNC-Dude wrote: There shouldn't be anything wrong with the dowel pin, they are all heat treated and should be very hard and strong. Another option is you can redrill the SBF cam gear to match the dowel location of the 6 cylinder cam once you open the ID up to 1.00". That would be the simplest fix you can come up with. Just make the gear fit the cam, instead of trying to make the cam fit the gear. Yeah, that was the reason for the last question. I haven't looked all through the box yet, but the cam is only drilled for the dowel. (meaning that dowel pin isn't sticking out the side of that snout) If it is up to the task, I'll certainly take the easier of the two paths to making this work. The only reason I was fretting over the 250 version of locating, and securing the cam gear was that I thought it was a weak link.At 420# of open spring pressure, I'm sure that that pin will see far more shear force than it was originally designed for. The next issue will be turning that round hole in the SBF gear into a rectangular keyway, if it isn't too wide for the thing already. The good thing is that the big hole has to come up .122 thou, and that'll be well into the small hole, leaving only the rectangular key cut to keep everything clocked properly. I think your confusing me, does the cam use a key or a dowel in the end of the cam? If you need a keyway cut into the cam gear, a machine shop can easily broach it in it when they enlarge it to 1.00" ID. I make crank hubs all the time with keyways broached in them, its no sweat. Hope Mike doesn't mind me answering this but if you go to this link, there's some good pics. Just keep in mind there's a spacer behind the pin a few thousandths thicker than the retaining plate that goes behind the pin. His set up may end up different. Ford's factory pins are not hard at all. You can squish them some when you pull them out with vise grips. No, D200S, I don't mind you answering for me. Those are really good pics of the stock setup, I couldn't ask for more. CNC dude, the stock cam sprocket has a rectangular keyway that slides over that little dowel. I was just saying that the hole that is currently in my SBF sprocket may be too big, and may not be usable for that reason, taking into account that it will have to be broach cut to properly secure the gear. Now,..........where would I get a dowel pin made out of Kryptonite to keep the thing from drifting/shearing,...and should I also consider doing like I suggested above, and grinding a flat/then machining the cam nose and welding the sprocket so I could have that flat machined into it opposite the DP, in addition to the weenie-assed dowel pin, 180 degrees on the other side? Mike the Dowel pin is 1/4 inch diameter. Here in Aus I went to a local bearing company and bought a 1/4" roller and cut it to length and pressed it in the hole. Now I have a hardened dowel pin. Another thing to ponder the cam gears are an interference fit and need to be pressed on. The dowel locates the gear and the retaining bolt stops the gear coming loose. Hope this helps. ausxb wrote: Mike the Dowel pin is 1/4 inch diameter. Here in Aus I went to a local bearing company and bought a 1/4" roller and cut it to length and pressed it in the hole. Now I have a hardened dowel pin. Another thing to ponder the cam gears are an interference fit and need to be pressed on. The dowel locates the gear and the retaining bolt stops the gear coming loose. Hope this helps. It does. Since I'm modifying the cam gear to fit, I can have my machinist cut it just shy of sliding on, so It'll become a press on. I knew the 240/300 used a keyway and assumed the 200/250 did also, and the SBF used a dowel pin arrangement. Just didn't know which setup you were trying to follow with this approach. The stock 250 US crank has the Windsor 221/255/260/289/302/351 and 335/385 series 351C and 429/460 crank snout of about 1.375, while the Aussie 221 and 250 I6 has the same crank snout diameter as the 144/170/187/200. That's a nominal 1.244 less a tolerance, similar to the small block Chevy V8 which is 1.255". 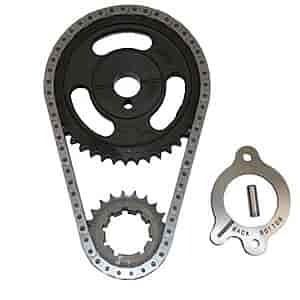 See "The 250 Timing Chain" http://www.fordsix.com/forum/viewtopic. ... 76#p547876, which includes "SBF timing set installed on Kelly's 250!" The differences are itemized intimately. Last edited by xctasy on Tue Mar 18, 2014 1:39 pm, edited 1 time in total. Correct me if I'm wrong...but isn't it impossible to have a "57 link" chain? I'm under the impression that Does10's chain is 56 link. Personally I hate welding on anything machined or trying to machine any weld. Have you finalized any plans yet? Did you find a pin with your cam? The stock US cam holes and pins seem to be about 5 or 6 thousandths larger than 1/4". What is yours? If you do decide to retain stock locating arrangement it looks like the best place for the keyway would be opposite the V8 dowel pin and maybe away from the oil slots. Wouldn't hurt to make the pin taller than stock making sure there's no vertical clearance or side clearance also to allow the pin to roll over. It looks like a letter F drill looks to be about the right size. You'd have to check this with what you have. I have used cobalt drills on some very tough material. Seems very tough and resilient. That might be a source for a pin. Right now, I'm finishing my intake, so I haven't given it too much thought. The objective will be to use whatever hardened pin I can find that fits the hole. If that happens to be a "F size" cobalt drill bit, then all the better,..I'll be able to source one at Fastenall. I was hoping to broach the existing SBFcam dowel hole in the new gear to act as my keyway for that drillbit dowel,....but if the hole is too big, then I guess I'll have to clock the gear 180 degrees, and cut the keyway opposite the existing dowel pin hole. There is a hole drilled perpendicular in the snout of my roller to accept the dowel pin that us stick on 250. Ok, so pretty much just drill and ream a hole in the cam gear and your set. I guess I now have "cause for concern". All I've heard is how un-machinable, and how "diamond hard" the cam, and it's related surfaces are gonna be. is a ragged edge at the dowel pin, so I thought I'd attempt to smooth it w/ a mill file. This isn't even 30 seconds of deliberate work. The front cam journal where the SBF dowel pin would have to go? That wasn't a 5 count using only light pressure and a new high speed steel (not cobalt) bit in my hand drill. Now, given that i have this cam, that I can file the snout w/ a standard mill file, and drill the front journal w/ a standard bit, a hand drill, and light pressure,..do I have cause for concern here? I get my 56 link chain from the supplier in Washington. He says that this is the "good India chain", but from what I know about chains, the Dido chain that came w/ my set looks superior to the 56 link India special. So, all in all I got this butter soft cam, and this india chain w/ what looks almost like roll pins holding the thing together. I feel like all I need now is a fuse and a match to set this bomb off. Yes, I would be concerned it is too soft. I have had cams that had a very sharp edge on the side of the lobe that needed deburring and it would just laugh at a file, and I had to use a cartridge roll abrasive to knock off just a tiny burr. I would call Comp or Crane and see what they would charge to check the hardness of it to make sure you don't have any lifter/lobe wear issues ahead of you. CNC-Dude wrote: Yes, I would be concerned it is too soft. I have had cams that had a very sharp edge on the side of the lobe that needed deburring and it would just laugh at a file, and I had to use a cartridge roll abrasive to knock off just a tiny burr. I would call Comp or Crane and see what they would charge to check the hardness of it to make sure you don't have any lifter/lobe wear issues ahead of you. There is a place here that can do that for me I believe. Was there anyway that just the wear surfaces were hardened, and not the whole thing? Usually when cams are copper plated, that masks areas where the heat treating is not needed to penetrate but just a certain amount. But for cams that aren't copper plated, it is probably equally heat treated all over, and should have a uniform hardness everywhere, even in non-wear areas. I would at least call Comp or some of the others and ask what Rockwell scale and hardness their roller cams are, then you'll have something to compare against. Tighe Cams Induction harden the lobes and journals so you have .080-.120" depth of hardness around your lobes & journals. Unlike the copper plated cams that are case hardened maybe .020". Also the material they use is 5160 steel which is a tough material. So where you have drilled is not hardened and that shoud be OK. Hope this helps. Our roller lifters here in the US are designed for 8620 cams. Hope their compatible with the Oz cams for Mike's sake. Thanks for the info ausxb, that just made up my mind which direction i'll be going with my cam. The Lifters will be fine on Mikes cam. I was also thinking about you hardened locating pin and would be loathed to use a cobalt drill for that purpose. If you use a needle roller it is much stronger. Try this, put a long needle roller in a vise and try to bend it with pliers or something it will bend, then put a cobalt drill or a carbide drill in the vise and try the same, I think you will find the drill bits break very easily. Being super hard usually means super brittle. Hope this helps. ausxb wrote: The Lifters will be fine on Mikes cam. I was also thinking about you hardened locating pin and would be loathed to use a cobalt drill for that purpose. If you use a needle roller it is much stronger. Try this, put a long needle roller in a vise and try to bend it with pliers or something it will bend, then put a cobalt drill or a carbide drill in the vise and try the same, I think you will find the drill bits break very easily. Being super hard usually means super brittle. Hope this helps. Thanks Ausxb. I was asking CNCdude whether that process is actually possible. Now I'm not gonna go trying to file a cam journal just the same, but I sure hope that you're right about the hardness of the wear surfaces. As for whether or not I use a hardened drill bit as a dowel, that just now became a mute point. I can walk into my area engine parts supplier, and buy the proper hardened cam dowel for the SBF application cam gear now that that option just opened back up. emailed Dean Tigue concerning the cam, this is his reply. Good enough for me. The fact that you can machine the camshaft in that area is normal. This is a heating and rapid cooling in areas that need to be hardened only. So the lobe and the journals will be around the 60 – 62 Rc hardness. The rest of the core will be around the 32Rc Hardness, This is a little softer than a high tensile bolt. If you are drilling the hole make sure you use coolant and keep the drill sharp. The material we use is 5160 and it does work harden very quickly, and then you will need a carbide drill.